There are new spinners in the world tonight, friends. Rejoice with me! 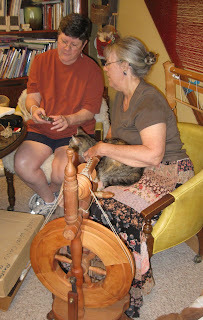 Today in the Red Barn, I had the pleasure of helping my new friend Holly, and my old friends Mary and Peggy get wool to become yarn - on drop spindles and on a beautiful antique Wee Peggy wheel from New Zealand. OK, I met Mary for the first time last month, but that just goes to show how awesome this community of ours really is! Once you sit down with us at the round table in the Red Barn, you're family. That's all it takes. A little later in the morning, Shareholder Linda got to stop by and tell us all about the incredible felted art pieces she has crafted that are making the rounds at art shows around town and out of town. We're so proud of you, Linda! We also wandered outside to meet the new alpaca boys and spend some time with the sheep on the north pasture. All our critters are such fun to watch. I love introducing them to new people and explaining each one's unique history and contribution to our farm. This afternoon, I got to meet sisters Liberty and Crystal, local girls who are very interested in learning to felt. I think they enjoyed getting the nickle tour of the farm, and getting a quick look at the vast potential of this incredible material that is wool! Our friend Kim also stopped by to glean more information and photos, in her never ending quest for a richer life closer to her food and her world for her beautiful family. important film that exposes the disturbing stuff going on behind the scenes of our country's food industry, and the dangers posed to our country's farmers and food consumers. One of my agricultural heroes, Joel Salatin, is featured in the film. His Polyface Farm is the poster child for how to do food right. He's written several books that I highly recommend to anyone thinking about taking their food quality into their own hands by raising their own crops or livestock. I hope you'll see the movie, and I hope you'll let me know what you think about it. 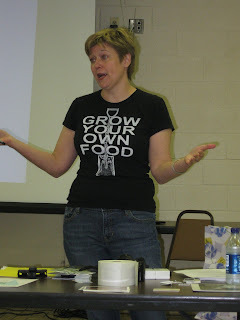 It makes me want a shirt like Susie G. had on at her lecture at the Maryland Sheep and Wool Festival. "Grow Your Own Food" indeed. 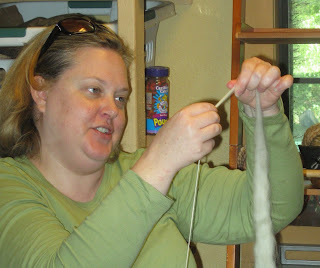 Spinning and dyeing and then knitting up the fiber...all after growing the fleece!? Could it get any better??? Well, We are learning to garden Texas style and one day I will be able to say, I am growing my own food. I grow some of it, now. Herbs are great and grew onions successfully. I am growing spinach, lettuce and cilantro. Still need to produce more tomatoes.